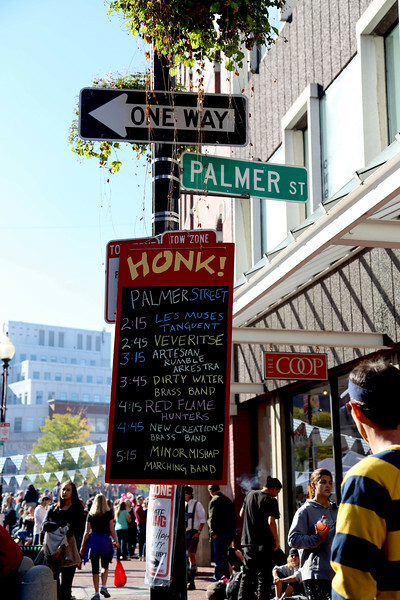 On Sunday, October 13, 2014, Harvard Square hosted its 36th annual Oktoberfest, which included a HONK! parade, beer gardens, live music, as well as food, clothing, and art vendors. Photos by Madeline Lear. A signpost shows the schedule for the HONK! Parade. People from all over the world stop by to taste the various foods, drink the beer, and listen to live music while appreciating the various artistic crafts presented. Photo by Madeline Lear.